training a special life experience to remember. vegetable carving, and breakthrough teaching methods! carvers, and college instructors is our Passion! Below: We invite you to enjoy an edited clip from an international television documentary featuring Paul Germain creatively expressing what the world's most respected, successful, and influential people depend upon to make their dreams a reality. forested mountains adjacent to Knoxville, Tennessee. not currently offering reservations for instruction. Update: the first stage of the relocatin is complete. We are now living in Oak Ridge. new AICD training studio can now begin. There is still a lot to do. We are hoping to be up and running again by this time next year. Have you heard that masterful ice carving, fruit carving, and vegetable carving skills are too difficult to learn quickly? It's not as difficult as it looks - when you learn from an AICD Master Instructor. Are you highly motivated and too busy for traditional classes? You will be inspired by how EASY, FAST, AND FUN true artistry can be when using AICD's innovative, proven techniques to create incredible ice sculptures and culinary masterpieces! you to our exclusive family of AICD graduates soon. All of AICD's Programs of Instruction can be reserved throughout the year. DIY parties, couple's activities, and team building! Note: The Fun Food Art and Fun Ice Art programs are for novice enthusiasts only. These introductory classes do not provide the comprehensive instruction offered in our programs for professional chefs. 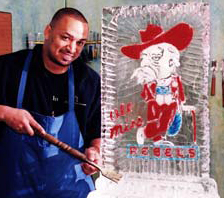 The ACADEMY OF ICE CARVING AND DESIGN serves the culinary and commercial ice carving industries by rapidly teaching the comprehensive skills needed to sell, design, create, and safely display profitable, custom designed, handcarved ice sculptures, Thai fruit carvings, and vegetable carvings. Innovative, state-of-the-art training techniques also provide "crash course" development of crucial artistic skills such as drawing and 3-D visualization needed for advanced ice, fruit, and vegetable carving! "AICD is setting the standard for excellence in preparing highly qualified, professionally certified chefs and ice carvers to meet the artistic demands and safety standards of both the high-end hospitality industry and the rapidly expanding commercial ice carving arena." Our private, one-on-one instruction is available for highly motivated ice carvers, fruit carvers, and vegetable carvers from around the world who want to advance at a rate that is optimum for their learning style, skill, and level of experience. Private instruction can be adapted to suit the individual carver's schedule. AICD's programs have also been developed to meet the advanced culinary training professional growth requirements of the American Culinary Federation's ACF certification program, the National Ice Carving Association NICA certification program, and top culinary schools. 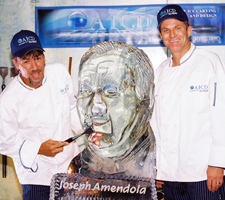 AICD also provides specialized curriculum guidance and training for executive chefs and culinary instructors who desire to teach the advanced techniques of professional ice carvers. AICD's comprehensive instructional objectives and proven curriculums are standards-based and measurable. Over the past 30 years, Paul Germain has developed, researched, and perfected the "best of the best" drawing, design, and safe ice carving training techniques from his own experience - and from acclaimed artists, fruit and vegetable carvers, and ice sculptors around the world! Condensed into multi-level, comprehensive training and certification formats, each program includes dynamic, hands-on, intensive, private training in the art of safely creating fruit carvings, vegetable carvings, and ice sculptures. Highly refined fruit carving instruction, vegetable carving instruction, and ice carving training programs have been designed to help carvers of any level develop artistic, multi-dimensional drawing, design, sculpture skills; faced carving in ice, computer enhanced custom design; closed-cell ice engraving; multiple block fusing; high-tech special effects; safe carving and transport methods; effective sales methods; media/public relations...and much more! Designed to provide the most comprehensive professional fruit carving classes, vegetable carving classes, ice sculpture training programs and ice carving school in the world, AICD’s Food Artist, Food and Ice Artist, Chef, Professional, Artisan, Instructor, and Master Ice Carver Certification Programs offer a broad range of design skills and technologies for students from around the globe including, but not limited to Mexico, Canada, United Kingdom, Brazil, France, Italy, Greece, Spain, Sweden, Holland, Russia, China, Germany, Jamaica, Australia, Dubai, Japan, Bali, and the Bahamas. AICD's one-to-one private instructional programs are for culinary educators, professional chefs, Thai fruit carvers, Thai vegetable carvers, garde mangers, ice carving instructors, career ice carvers, culinary students, catering directors, banquet managers, and sales associates who want to excel in their ability to market, design, sell, carve, deliver, and safely display fruit carvings, vegetable carvings, and ice sculptures. Adjunct instructors are world renown fruit and vegetable carver Chef Ray Duey and ice sculptor Steve Brice. To maintain the integrity of AICD's educational programs, activities such as competitions, attendance at conventions, and community activities can not be used as credit for receiving AICD Certification. However, in certain instances, a carver's particular experience may qualify as the prerequisite for more advanced instructional programs. Located in Fresno, California, AICD is dedicated to providing the most comprehensive and safe fruit, vegetable, and ice sculpture training possible for ice sculpture companies, hotels, caterers, country clubs, and culinary schools from around the world seeking to employ highly qualified, professionally certificated chefs, garde mangers, ice carvers, banquet managers, and catering sales associates. 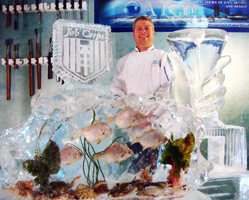 In addition to providing comprehensive private ice carving instruction and ongoing support for graduates, AICD will be hosting special events featuring well known leaders in the food carving and ice sculpting industry who have distinguished themselves in either the commercial or competitive arenas such as the Food Network. AICD provides one-to-one personalized instruction that is tailored for each student's experience and future objectives. Private instruction ensures that professional chefs and carvers of any level receive far more actual ice sculpting training and individual guidance than is possible within group ice sculpture classes and fruit carving lessons. It also provides a much safer and more productive learning environment for developing the advanced drawing, art, and design skills needed for highly realistic and creative multiple ice block constructions and advanced fruit and vegetable carvings. Photos of our students' first custom ice sculpture and fruit carving projects (which were completed during actual instruction) provide a thrilling glimpse of just how successful our ice sculpture and fruit carving training methods are. Because of Paul Germain's success in integrating the combined experience of world class carvers, award winning art educators, ice carving books, fruit and vegetable carving books, fruit and vegetable carving videos and DVD's, Food Network, distinguished executive chefs and garde mangers, AICD students are capable of developing advanced carving and design skills that will give any hotel, country club, caterer, culinary school, or ice sculpture company the competitive edge that is so important in today's market. 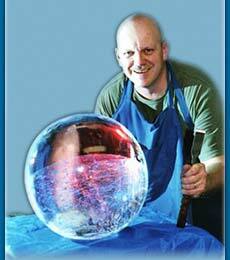 The ice carving industry is growing at a phenomenal rate in the U.S and around the world. Whether you are a beginning or experienced ice carver, the sooner you reserve one of AICD's remarkable opportunities for private instruction, the sooner you too will also be on your way "to safely accomplish the dazzling and profitable ice sculpting and fruit carving feats of a very privileged few."